Back in the early days of our relationship, dinner was always a big deal. When Manuel and I were lucky enough to find ourselves together (this was a long-distance relationship, after all), we made up for lost time by having elaborate and sumptuous meals every night. We’d think nothing of spending days planning meals and shopping for the right ingredients, we’d try new recipes like they were going out of style and just generally enjoy our food in a way we couldn’t do when we were alone. When we were in Germany, despite the fact that Manuel lived in a small studio apartment with no real dining area, we purchased a beautiful wooden table from Ikea and made it the focal point of the tiny room. Every night we’d sit down with candles lit, music playing and a nice bottle of wine as we lingered for hours over the food. Everything was made from scratch, and as far as I recall the terms "quick" and "easy" didn’t even exist in my vocabulary. Oh, and the TV? I can’t even remember if we had one*. Then, of course, real life happened. I started working, we got married and moved to Scotland, and dinner started sometimes being more of a chore than a pleasure. And also despite our best efforts, little things started eating away at our evening traditions. First it was the box of candles that got used up and never replaced. Then it was the infrequency of that bottle of wine – alcohol being an expensive libation in our new country of residence. Then it was the simple enjoyment of sprawling out on the sofa and watching television after a long day of work. And finally it was the strange new roles our table started taking on: wet-clothes hanger, mail and magazine repository, general junk-collector. One night I walked out with hot plates of food only to realize that the table was completely covered in drying bedsheets. "What are we going to do?" I asked Manuel. "Well, we can eat on the sofa." And of course if you’re sitting on the sofa you might as well be watching television. And that’s how our TV dinners were born. At first I always treated having our dinner in front of the television as a slightly exciting anomaly. I would get tingly from the thought that we were doing something naughty – eating while watching TV being absolutely forbidden in my house growing up. But the more frequently we did it, the more normal it seemed. We even started planning our meals around what we wanted to eat during our favorite shows: sweet potatoes and CSI, polenta and Desperate Housewives, spaghetti and reruns of Seinfeld. Eating on the sofa necessitated a fundamental change in cooking style as well, as there are many things that are just too hard to eat cleanly while semi-reclining and balancing a plate on one’s lap. Large pieces of meat are most definitely out the window, as is anything requiring two hands or messy sauces. One-dish meals of pasta or risotto are perfect, along with big bowls of crunchy salads and stir-frys. And then of course there’s pizza, which goes with on-screen entertainment like a fish goes with water and comes in so many delicious variations you could easily spend a lifetime eating it and never get bored. In fact there’s a whole slew of new recipes in my arsenal now that I may have never come across if I wasn’t looking for things that were quick and mess-free, like this mindbogglingly good combination of figs, ricotta, prosciutto and flatbread. It certainly raises the bar on the concept of a TV dinner, if it doesn’t obliterate it completely. Don’t worry, we do still occasionally eat at our table. After all, there are some nights we just can’t find anything good on TV. Note: All quantities here are approximate – add as much as you like to each individual pizza. You can easily make this vegetarian by leaving out the prosciutto – just substitute something else salty such as kalamata olives, crumbled feta or roquefort cheese. Also, I like to sprinkle each slice of fig with a pinch of sugar before putting everything in the oven to get a nice caramelized effect – this also helps the flavor if they’re not naturally very sweet. Season the ricotta to taste with salt and pepper. 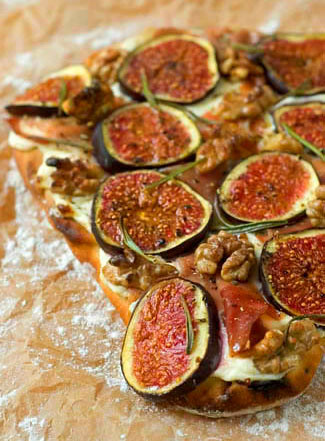 Spread it evenly on the flatbreads, and cover with the prosciutto, fig slices, walnuts and rosemary. Drizzle with a little olive oil, sprinkle with a little additional salt and pepper (and sugar on figs, if using) and pop into a 450F/220C oven for about 10 minutes. Melissa,Unless I have guests, I always eat in front of the TV — whether it’s on or off. I have a dining table but it’s set up with lights and stuff for photography so using it is a real pain.But if you’re going to eat in front of the TV you need a serving tray (with high rims and handles). Thus equipped, you can eat anything from fettucini to soup without making a mess. This sounds delicious and I’ll have to try it. I’m always looking for easy things to do for supper. I don’t always feel like cooking when I come home from work.Sometimes on the weekends I make a large batch of something and divide it into one-person portions to freeze. It helps. ha ha ha! Now that I am finished grad school I have returned to actually eating at the table…I have to say though – this is so NOT a T.V. dinner. Oh my more figs! And now with proscuitto, one of my favourite salty-sweet, absolutely luscious combinations. I may have found the dinner for us tonight! This could also be lovely as a quick party nibble – cut the naan with a biscuit cutter into rounds, or into elegant long triangles and I’m sure it would be lovely. I love it – we often eat our dinner in front of the tv but you’ve taken it up many a notch to an elegant dining experience.Thanks for sharing, it looks positively scrumptious. Can I come to your house for dinner?! Melissa, you’re such a natural with artful food combinations. Gorgeous, m’dear–what a voluptuous-looking pizza. I’m just sighing for the fact that you were able to use such wonderful looking figs! I’ve tried in vain to find ones with FLAVOR. Bland-tasting ones always left my dishes lacking that special note! Hi Michele – Of course I would never assume you do it! No sir, what would the Parisians think? Those uncultured Canadians, eating pizza in front of the television… :)Hi Kevin – Somehow I never thought of actually investing in something to make the sofa-dining experience any easier… I suppose it would mean admitting to myself that this is a habit we’re not going to kick anytime soon!Hi Ana – I’ve always had the utmost admiration for people who are organized enough to cook like that on the weekends. I’ve always meant to give it a try and see how much easier it makes our lives – unfortunately the shoebox-sized freezer we have at the moment doesn’t really lend itself to these good intentions…Hi Jen – That’s interesting, because for most of my student years I cooked and ate really nice meals at the table. It was a ‘legitimate’ reason to be away from the books (tv obviously not being legitimate)! Hi J – I’m so glad this has brought out the truth from everybody! I’m trying to imagine you sitting on the floor in front of the tv with all your exquisite desserts, but somehow I just can’t manage… :)Hi Pille – Thanks for joining in the confession session – it feels good to get the truth out, doesn’t it? 😉 I haven’t yet seen Without a Trace, but if you say it’s good, I’ll definitely give it a shot. Our Monday night lineup is rather barren at the moment! Hi Tara – Oh, I’m with you on the figs and prosciutto (obviously!). I also love figs and blue cheese, and did a variation of this pizza with that too. And you’ve got a great idea, this would be perfect for a party – out of the ordinary but so easy. If only fig season would last a little longer!Hi Ruth – Thanks! Elegant or not, food should be delicious no matter where we eat it! Hi Jeanne – Sure, you know guests are the only thing that compel us to clean off our table!Hi Molly – Well, I can’t say I didn’t have a little nudge in the pizza-inspiration department a few days ago. Wonder where it came from? :)Hi Rowena – No figs with flavor in Italy??? I’ve had some mixed results with our figs this year, but the majority have been pretty good. I think they’re mostly from Turkey at the moment, but I’m still looking out for ones grown closer to home. I am (still) up to my ears in figs and just when I thought I had seen every recipe, I come here and see THIS. I am enthralled, and suddenly quite hungry. Thank you so much for the inspiration! oh, yes! those nights by the TV look familiar to me. but the pizza, with the figs, mmmm. what different flavours, sweet and salty!I love it! will try it soon!! Another win for The Traveler’s Lunchbox! (Slashfood’s Pizza Day Grand Prize at http://www.slashfood.com/2005/09/27/pizza-day-winners/) And once again, well-deserved! You’re on a delicious roll, Melissa…congratulations…! OMG. I *need* this pizza. NOW!Congrats on the win Melissa. No wonder. It looks and sounds incredible. I must say, this pizza does not look appetizing. But if it's worth a shot I'll try it… it just won't taste like "pizza."